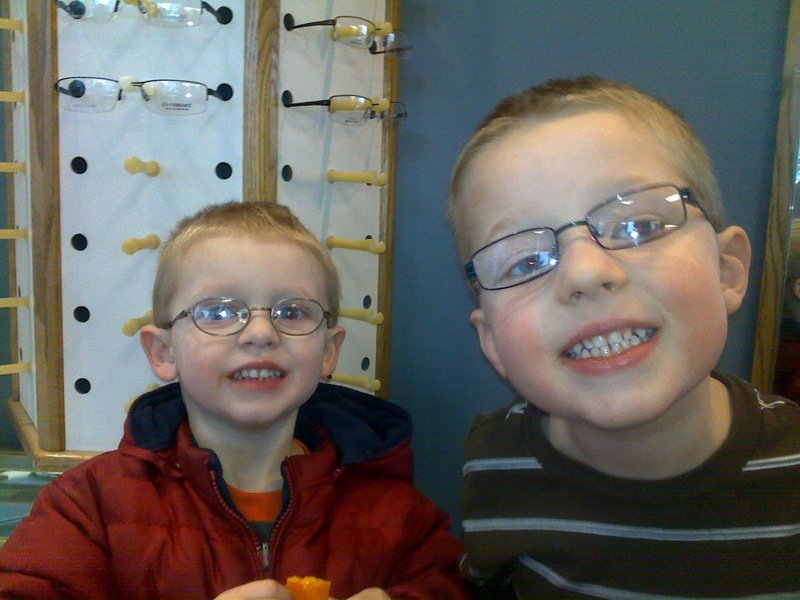 Then, we found that Jacob needed glasses as much as or maybe even more than Reed did, so we got him a pair as well. I've been wearing my reading glasses more, so we're a family of intellectuals, to an extent. 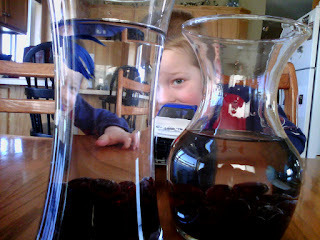 Last weekend, while running errands, we decided we didn't have enough things to keep us busy, so having two more creatures for which to care seemed in order. I think Andrea is trying to plant the seed in my head that we should get a dog; she suggested we get the boys a few fish so they would know what it's like to have a pet. 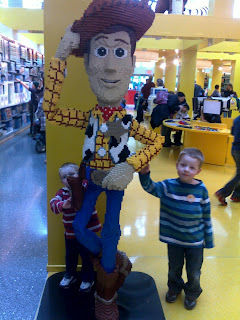 (We gave Charlie up a year and a half ago; Jacob probably remembers him a little bit, but Reed likely doesn't.) Oh, and Jacob named these two fish Charlie and Hunter after our and Doug and Sarah's dogs, respectively. Last night, a package came in the mail from Nate and Lonnea. It was Andrea's and my Christmas presents (late, yes, but I don't mind). 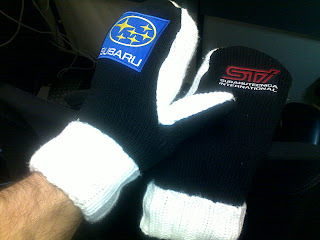 I opened it up to find two pairs of mittens, homemade by a friend of Nate's. Mine have Subaru and STi badges on them; Andrea's have Clearwater Fire Department. They are quite warm. I'm almost disappointed that this winter has been so mild. Almost. Just over a year ago, I acquired The Intellectual Devotional by way of swap.com. I was interested in the book because it's a full year of different subjects -- one per day for 365 days -- and each day of the week is a particular topic (philosophy on Saturday, religion on Sunday, etc.). Apparently that first paragraph is so important that they thought it should be repeated. One of my gripes about the substance of the book is that it seemed science subjects were shorter than others. Maybe that's just my perception, but when each subject is no more than one page, I find it hard to believe that the authors had a hard time filling that one page. Also, their "additional facts" were much more trivia than useful knowledge. The above page, for example, included the additional fact that "The two fission bombs the United States dropped over Japan in August 1945 were Little Boy and Fat Man." 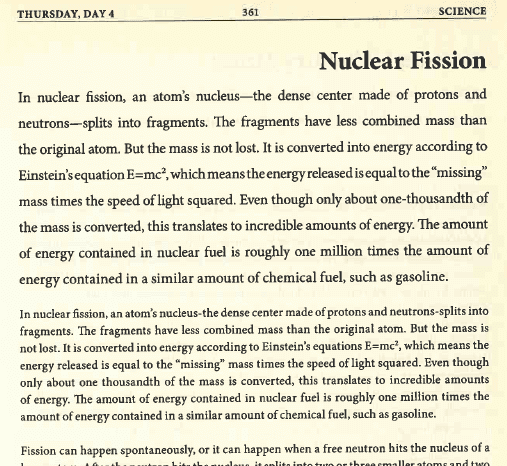 More interesting facts are that Uranium-235 -- the most common type of nuclear fuel, also mentioned on this page -- has a half life of 700 million years and that Uranium-238's half life is over 4.4 billion years. Or you could just tell us the names of the first two fission bombs used against an enemy during war. That works, too. This morning I finished another book on game theory: Rock, Paper, Scissors: Game Theory in Everyday Life (Len Fisher). I also wrote briefly about another such book I read last year, The Complete Idiot's Guide to Game Theory (Rosenthal), which was rather technical, whereas Rock, Paper, Scissors was very much a layman's book. I actually enjoyed Rosenthal's book more -- probably because of the technical nature of it. I find game theory rather interesting because it's a rather mathematical and scientific look at ways to solve real problems such as political infighting, anti-competitive behavior of corporations, arms races, and so on. For technical people, I would not recommend Rock, Paper, Scissors, though if you want a pretty easy read on the topic, it's not bad. In other news, Jacob is apparently getting glasses soon -- not a year after Reed got his glasses. I'll be sure to post some pictures and maybe even videos as we did with Reed (video one and video two on my YouTube channel).